At the end of the Qing Dynasty the merchant Mr. Xu Jin, came from Quanzhou in Fujian province (China) to Xiluo and set up this tea shop called Jie Fa Qian Ji Tea Shop. 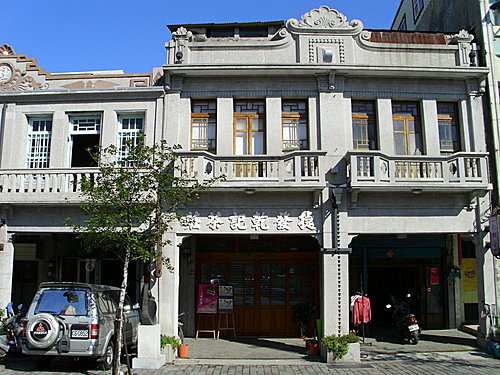 Jie Fa is a double-facade house of three floors which overlooks the Yanping road on numbers 90 to 92, both of them built by Xu Jin. After two generations, No 90 passed to another owner, nowadays only No 92 can betray its past as Tea Shop. The first row of Jie Fa Tea Shop was built in 1932, the second and the third one were built in line with the courtyard house style typical to Fujian province. The work to develop and expand downtown Xiluo was undertaken during the Japanese Showa reign and there was a large-scale construction of new buildings. In 1936 Xu Jin was very satisfied and he supported the project of rebuilding his courtyard house as a gorgeous three open space and two-storey western-style building. The house was such a success that it became the second most exquisite building in Xiluo. The family name was removed from the roof and a sturdy monument of a wing spreading eagle was placed as the symbol of the house. Since 2002 the shop became an exhibition hall and a backpackers’ house. The inner part of the house is open to the tourists who want to visit it and feel like the old inhabitants of the Old Street. Moreover there are about 235 square meters (71 ping) of backyard that link Yanping road with Xiuwen street, because this was the Han and the Ying old style of buildings and streets.